This page provides step-by-step instructions on how to log in to Moodle, access a course and log out. 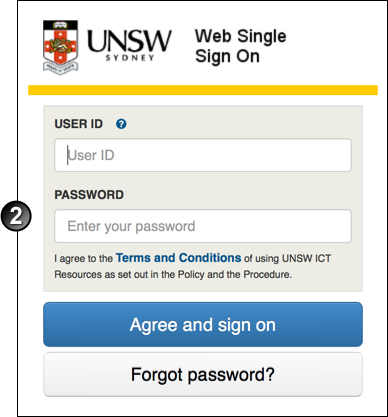 To log in, you must have an active record in the UNSW HR system. You will also need a staff ID (zID) and password (zPass). Click this link for instructions on logging in as one of your students. This resource explains how a staff member can log in, access a course and log out of the Moodle Learning Management System. Staff can access Moodle to perform a wide range of tasks such as the creation and facilitation of collaborative learning environments to enhance their students learning experience at UNSW. Go to the Moodle Login/Web Single Sign On page. Are you logging in to courses offered by institutions using Australian Access Federation (AAF), such as UNSW AGSM Executive Education, UNSW Institute of Languages? If you are, click the appropriate alternative login link in the Looking for help? section lower on the login page. Enter your User ID (your staff number) and Password (your zPass) and click Sign on/Login or press Enter). The My courses page displays, containing a list of links to all your Moodle courses. Did your login fail? It's possible that your staff record is either suspended or inactive in the system. This is particularly likely if you are a sessional teacher. You may need to contact HR to be formally re-employed and added to the staff database, and may need to wait 48 hours for the changes to be processed. Note your password may have expired while you were unemployed and you may need to contact the IT Service Centre on 02 9385 1333 to have it reset. "Your session has timed out. Please log in again." Courses that you have access too will appear on the homepage. If you do not have access to the course, or if you have a long course listing due to having access to many courses, you may wish to use the search facility to find the course (click Moodle Home at the upper right of the page). Click the name of the course. The course home page displays. If you can’t see a course that you are looking for go to the Site Home page and search for your course or click Show all courses at the bottom of the central Course overview section. To log out of Moodle, click Logout at the upper right of the page, next to the message, "You are logged in as..."
If you experience technical or other issues, consult the Where to get help page.